Agnews, Baines, Be Modern, Capital, Cast Tec, Dimplex, Evonic, Flamerite, Focus, Gazco, GB Surrounds, Parkers, Stovax, Taylor Made, Valor, Warm Home and many more. Whether you have a chimney or not, you can still have an electric fireplace that will provide you with all the comfort and realism of a real fire. It can also make a stylish statement in your home. Our electric fires give you all the colours and movement of real dancing flames above a bed of fuel. 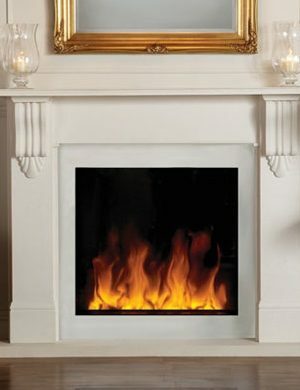 Electric flame pictures are now incredibly convincing and will become a main focal point in your home for years to come. Many of the electric fires now have remote control, making them easy to use and also easy to fit. You can make your fireplace unique to you, by choosing individual components to create the fireplace of your dreams and we are here to help you achieve the exact fire you want. A lot of fires are available with different fuel effects from the traditional logs or coals to the more modern glass beads or pebbles. Electric fires are available floor or wall mounted, inset or outset, in many designs and colours. Enabling you to create a unique ambiance in your room. Floor mounted electric fires can be set in many different fireplaces, which can be made from timber, stone, marble, MDF, in either veneered or painted finish and in many colours. Some designs have complementary furniture to match. Where no recess exists, an extra ‘spacer’ can be supplied for most models, allowing them to fit flat on to the wall or fireplace.